We are excited about a number of new products that are now available. They have been in development for a while, and we think they were worth the wait! 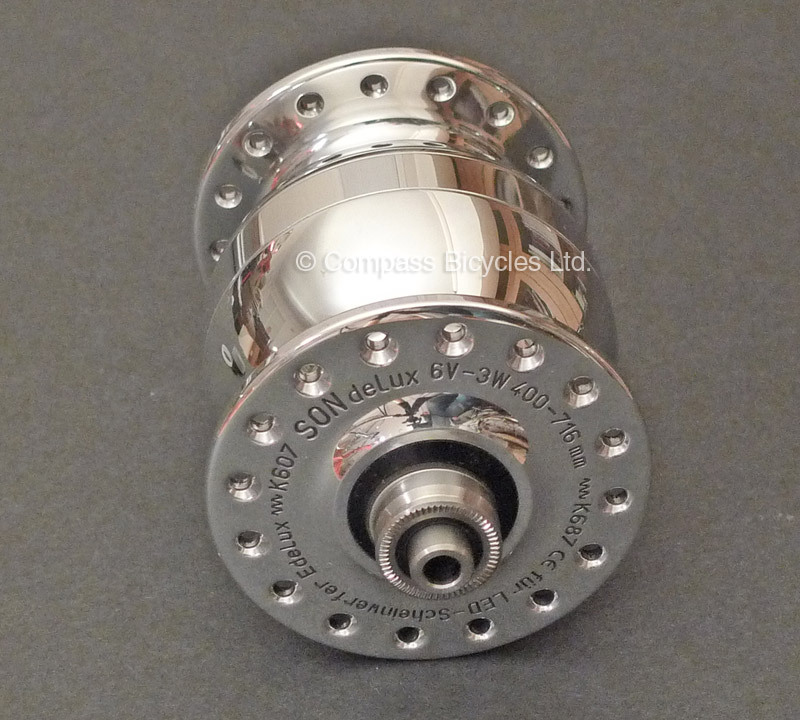 We really like the SON Delux “Wide-Body” generator hubs. The wider flanges make for a stronger wheel than the standard Delux hub with its very narrow flange spacing, and the wheel looks a nicer as it fills out the fork. Now the “Wide-Body” hubs are available with Schmidt’s “connector-less” SL system, in which the hub transmits energy to a contact plate in the dropout. No longer do you need to unplug any wires as you remove your wheel. You need a special fork with the insulated contact plate, so you can’t just install one on your existing bike, but it’s a neat option for a new bike. The standard “Wide-Body” Delux hub with connectors remains available as well. Both are in stock with 32 and 36 holes. Supplies with the SL system are limited for now, but we hope that this will become a standard production model in the future. More information is here. The Grand Bois fork crown for wide tires now is available in stainless steel, in addition to the cromoly steel version. To me, the fork crown is the focal point of the bike. It’s what I first notice when I look at a bike. Classic bikes often had chrome-plated fork crowns. Stainless steel can be polished to a chrome-like finish without the cost and environmental hazards of chrome-plating. Stainless steel must be silver-brazed, so a good fit is important. (Silver cannot “bridge” gaps like brass can.) The Grand Bois crown is designed specifically for the Kaisei “Toei Special” fork blades, which use the “old Imperial” oval cross-section at the top and have a very slim profile at the bottom for optimum shock absorption. 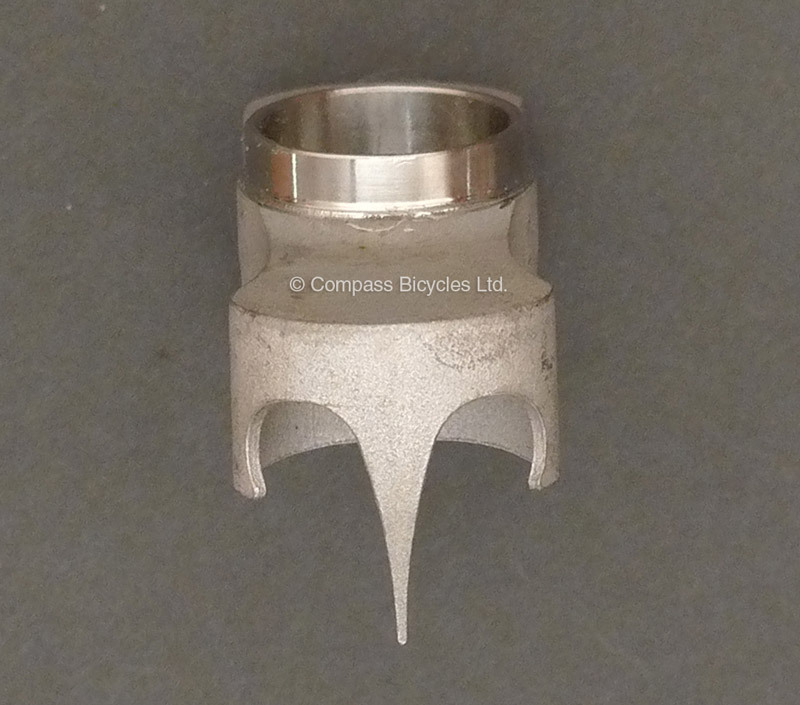 The blades fit into the crown with a perfect fit, ideal for silver-brazing. More information is here. This entry was posted in Components, Framebuilding supplies, Lighting, Product News. Bookmark the permalink. Any chance of a disc brake version of these hubs? Road-specific hydraulic brakes are apparently right around the corner…. With disc brakes, you need narrower flange spacing to make room for the disc. Schmidt offers the SON28 and the standard Delux for disc brakes, both with standard connectors and with the connector-less SL system. Yes, Delux Wide-Body SL!! Woohoo! (Can’t wait until I can afford one…) I sure hope these stick around.